1 What Is a Milk Frother? 2 How to Froth Milk with a Hand Frother? 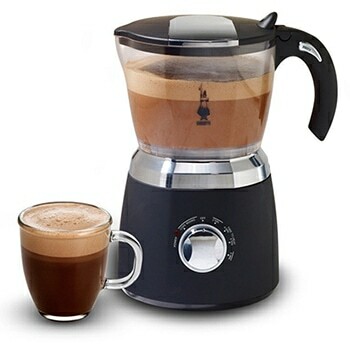 4 What Is an Auto Frother? 6 What Is a Frothing Pitcher? Any device used to aerate milk to create foam to enhance the texture and flavor of specialty coffee drinks. Milk frothers come in a variety of shapes, sizes and styles. How to Froth Milk with a Hand Frother? Decide if you want to use warm or cold milk. If warm, then the “sweet spot,” temperature-wise is between 150 and 155 degrees (Fahrenheit). Once milk is at desired temperature, add it to the frothing pitcher. Fill the pitcher to no more than a third. Place the lid on the pitcher and make sure it’s properly sealed, then give the plunger a couple of test plunges to make sure you’re not sloshing any milk out. ​Assuming your initial test is successful, begin pumping the plunger with vigor. After about ten seconds, you’ll begin to feel the pressure change. You’ll notice that it’s slightly harder to continue depressing the plunger. That’s a sign that it’s working! The exact duration will vary, but count on repeating this motion for a minimum of 25-30 seconds. The more you plunge, and the more force you use, the more aerated your milk will be. ​Check your progress at regular intervals. Once you’re satisfied with your results, remove the lid and plunger and tap the whisk to remove any excess froth, so that it falls back into the pitcher. 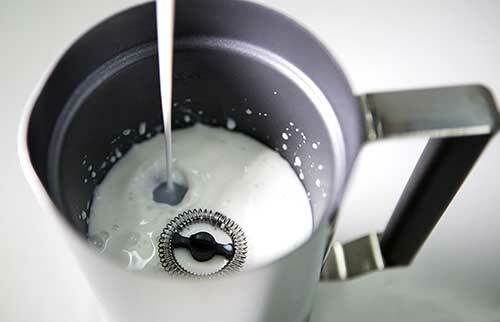 ​Swirl the pitcher gently in a circular motion, and/or tap the bottom to help the milk settle a bit before use. ​Once the froth has settled, gently pour the frothed milk into another container and microwave it for about thirty seconds (exact time varies from one microwave to the next). IMPORTANT! Do not let the milk boil! ​Using a spoon, remove dollops of this cream and place atop the coffee drink you’ve been preparing in tandem with this process. What Is an Auto Frother? In the section above, we mentioned milk frothing technologies that are built into many espresso machines. These come in two basic varieties: Steam Wands and Auto frothers. 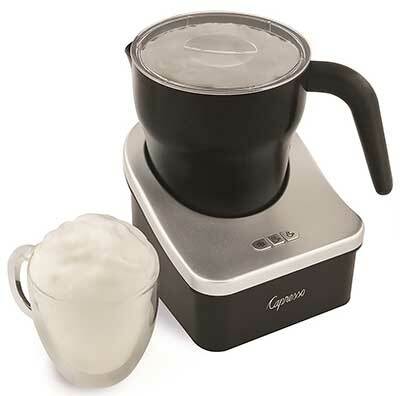 The quick answer is that an auto frother is any technology that provides milk froth with little to no input from the user. But that answer doesn’t really do the auto frother justice, so let’s take a look at it in a bit more detail. The self-contained units feature a carafe that plugs directly into the espresso machine. You pour milk into the carafe, plug the carafe into the machine, and when you order a milk-based specialty coffee drink, the auto frother will work its magic and dispense a combination of steamed milk and froth into your waiting cup. Usually these machines feature a knob or dial that gives you at least some ability to modify the amount and quality of milk froth produced, but your level of control is typically fairly limited. The “Appendage-style” auto frothers lack a carafe that plugs directly into the unit. In its place, you are expected to provide a frothing pitcher or other container to pour the milk in, and the machine comes with a length of rubber hose. ​One end of the rubber hose is fed into your milk container, while the other is plugged into the espresso machine. When a milk-based drink is ordered, milk is sucked through the rubber tubing into the boiler, where it is heated, then dispensed into your waiting cup. Again, in many (but not all) cases, these machines offer limited ability to control the quality and quantity of froth produced. Contrast this with the workings of a conventional steam wand, which sees you pour milk into a frothing pitcher and hold it beneath the steam wand to generate the frothing action that creates the steamed/frothed milk. Ultimately, this is going to come down to exactly what kind of frother you’re using. We’ll cover the most common of these below. If you’re old school and use a piston or direct lever espresso maker, then learning how to use a manual milk frother is essential, and will be one of the keys to making your favorite specialty drinks. Piston/Direct lever machines and manual frothing pitchers offer a couple of key advantages over their more high-tech counterparts. First is price. They tend to be a lot cheaper than their automatic cousins. Second, and perhaps more importantly is the fact that they are portable. You can take them with you wherever you go, and they can be used even when the power’s out. While that may not matter very often, the first time you’re snowed in for several days without any lights, you’ll be thanking your lucky stars you’ve got a low-tech specialty coffee solution! Fortunately, learning how to use a handheld milk frother is easy, but the process itself is somewhat time consuming. We’ll outline the steps in this section so you know exactly what you’re in for! Simply put, it’s the container you place the milk inside for frothing. What Is a Frothing Pitcher? A frothing pitcher is a container used to froth or steam milk as part of the creation of any specialty coffee drink that lists milk, cream, or foam as part of the recipe (so cappuccino and latte style drinks). They come in all shapes and sizes, and are made from a variety of materials, although stainless steel frothing pitchers are widely regarded as being best-in-class. Size-wise, if your espresso maker didn’t come with one that was designed specifically for your machine, the most crucial consideration is to get one properly sized to whatever machine you have. Some machines will have a steam wand built onto the machine itself, and your pitcher needs to be able to fit beneath it so the steam wand can descend deep into the pitcher. Other models come with a wand you wield yourself, which you’ll manually insert into the pitcher. Here, the key consideration is the length of the wand. If you have a short wand, you’ll need a short pitcher, so again, whatever you settle on, your purchase must be made with the specifications of your other equipment in mind! Frequently though, when the question gets asked, the image people have in their minds is a manual frothing pitcher. These are fairly common, and generally modestly priced. 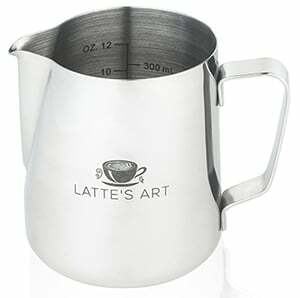 In the overwhelming majority of cases, if you’ve got a semi or super-automatic espresso machine, you won’t need a manual frothing pitcher, but if you’re using a manual machine, these should be considered an essential companion device. The first question to ask yourself, is: Do you want to froth warm or cold milk? A hand frother can do both! If you’re going to use cold milk, then it’s as simple as adding it to your pitcher from the fridge. If you’re going to use warm milk, then you’re going to want to begin by heating it either on the stove top or in the microwave. Pro Tip: This is extremely important in terms of learning how to use a milk frother at home with warm milk. You absolutely do not want to let the milk come to a boil! If it does, you need to just throw it out and start over, because it won’t foam, and it’ll taste terrible. If your plan is to use warm milk, then you’ll probably also want to invest in an espresso thermometer, so you can accurately monitor the temperature of your milk. The sweet spot is between 150 and 155 degrees (Fahrenheit). Once you’ve gotten your milk to the desired temperature (if warming), add it to your frothing pitcher. The correct level is important. If you overfill the pitcher, you’re going to wind up making a mess, so be sure not to fill it more than a third full. Note that some (but not all) manual frothing pitchers have a “fill line” etched into their surface to serve as a guide. The reason this is so important is because you are the force behind manual frothing. You’ll be depressing the plunger at the top of the pitcher, which circulates and froths the milk inside. Fill the pitcher too full, and you’ll wind up wearing it! Once your milk is poured, place the lid, and be sure it’s properly sealed. Give the plunger a couple of test plunges to make sure you’re not sloshing any milk out. Assuming your initial tests met with success, begin pumping the plunger with vigor. This part will take some testing and experimentation on your part, because how long you have to do this depends on a number of factors, not the least of which is the total amount of force you’re using. Typically, after about ten seconds, you’ll begin to feel the pressure change. You’ll notice that it’s slightly harder to continue depressing the plunger. That’s a sign that it’s working! Again, the exact time will vary, but at a minimum, count on doing this for 25-30 seconds. The more you plunge, and the more force you use, the more aerated your milk will be. Note that you’re doing all of this by feel alone, which is where you’ll need to develop some skill, because you can’t see the milk while you’re engaged in this step. ​Early on, this will probably see you stopping at intervals and removing the lid to check your progress. If you’ve purchased a glass frothing pitcher, you have a slight advantage in that you’ll be able to mark your progress at a glance. Once you’re satisfied with your results, remove the lid and plunger and tap the whisk to remove any excess froth, so that it falls back into the pitcher. At this point, the froth will be quite bubbly and not fit for use, so you’ll want to swirl the pitcher gently in a circular motion, and/or tap the bottom to help the milk settle a bit before use. Once it has settled, gently pour the frothed milk into another container and microwave it for about thirty seconds. The exact time will depend on the power of your microwave, but again, the trick here is to reheat it (because if it was warmed when you started, it will have lost a significant amount of its heat during the process you just completed), but you don’t want it to boil. If it does, your only option is to start over with a fresh batch. Between settling and reheating, most of the larger bubbles will have disappeared, and you’ll be left with foam of a smooth, creamy consistency. ​Using a spoon, remove dollops of this cream and place atop the coffee drink you’ve been preparing in tandem with this process, and you’re ready to enjoy yourself. And now you know how to make milk foam with a frother! ​​​Final note: It is possible to create foam using alternative milk products like soy or rice milk, but it’s somewhat harder to do – you’ll have to spend more time on the plunger, but with persistence, you can enjoy excellent foam, even if you’re lactose intolerant! If “old school” really isn’t your thing, then you’ll probably gravitate to either a semi or super-automatic espresso machine. 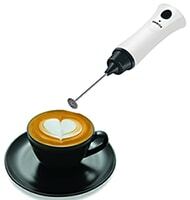 And if you do, then you’ll need to learn how to use a frother wand to make your favorite coffee creations. As with using the manual frother, it does take some skill to master, but we’ll outline the process below. Before you put your frothing wand into milk, be sure to purge it first! This is one of the most common mistakes a beginner will make, but if you don’t, what will happen is that when you first activate the wand, it’ll release water into your milk, predictably watering it down. Just purge it into your machine’s drip tray, or into any nearby empty glass. When you see nothing but steam, you’re ready to go! Carefully insert the tip of the wand below the surface of the milk. This is hands down the trickiest part of learning to use your wand well. If you have the wand too deep in the container, not only will it make an awful noise, but it won’t give you the consistency you’re looking for. ​If you’ve got the depth right, you’ll soon see the milk swirling around in the container, creating a tiny, white whirlpool – this is how you know you’re doing it right, and this is exactly what you want! This is the action that aerates the milk as it heats it. Important! For best results, tilt your milk container at a slight angle. Doing this should not disrupt the whirlpool action in the least. This is critical for what baristas refer to as “polishing” and takes some practice to get right. When you do get it right, you’ll wind up with world class, fine foam, every time! Remember, the sweet spot is 150-155 degrees. Experienced baristas know their equipment inside and out and have the timing down pat. You’re going to need to experiment and check your temperature (or just insert an espresso thermometer into the milk so you can get a constant read on it). ​Since the wand is an open, and much more active process, you’ll see the foam begin to form, and when the consistency meets your needs for the drink you’re preparing, you’ll know exactly when to stop. Once you’ve got the consistency you’re looking for, remove the wand and give the milk container a solid whack against the counter. You’ve probably seen bakers do this with cakes when they first come out of the oven. Same concept. Your objective here is to get rid of the larger bubbles and help the foam settle. If you’ve done everything correctly, you’ll have a layer of froth sitting on top, and steamed milk beneath. At that point, it’s ready to pour into whatever specialty drink you are creating. That’s all there is to it, but make no mistake, it takes practice to use a wand well. Don’t be surprised if your first several attempts don’t turn out as you’d hoped. Just keep practicing and you will get there! If you have a little battery powered, hand-held whisk milk frother, you can use it right in your cup to make fantastic milk and coffee drinks! To do this, simply heat some milk on the stove (remember, as before, don’t let it come to a boil). When it’s warm, pour it into your coffee cup, filling the cup with about one third milk. Bring your hand frother to bear in the cup, whisking until you have the desired level of froth. Then pour coffee on top of the milk and froth. The froth, being lighter, will float to the top, and you’ve got an instant approximation of a specialty coffee drink! We get this question frequently, but honestly, there are so many makes, models, and brands of espresso machines on the market today, the best advice we can give here is to follow the instructions in the manual you should have received when you bought the unit. There are a couple of wrinkles that are worth mentioning, and this mostly comes from experience and experimentation. For example, it matters very much whether your machine is a single or double boiler. If it’s a single, then you’re probably going to want to prep your milk first, froth it, and have it on standby, popping it in the microwave briefly, just before adding it to your coffee, to heat it back up once your drink is ready. If you have a double boiler machine, then you’ll need to use it often enough to get a sense for which process finishes first, and start it last, so that the two finish at about the same time. In most (but not all) cases, the milk steaming and frothing will be the faster of the two, but again, there are so many different machines out there that the only way to know this for sure on your machine is to make a few drinks and get a good feel for it so you can get your timing right. Your milk frother will be your new best friend if you’re a fan of cappuccinos, because the ideal cappuccino is one third coffee, one third milk, and one third foam. The easiest milk frother for a novice to use when making cappuccino is a clear glass one so you can see how much foam you’ve got as you work the pump. Ideally, you’re shooting for a 50/50 mix here. Literally all you have to do is brew your coffee at whatever strength you prefer, and while it’s brewing, prep your milk (for best results, warm it first, in a milk steamer if you have one, or in a microwave if you don’t). Pour the warm milk into the frother and work the pump until you get half foam, half milk. Pour your coffee into your favorite mug, then pour your milk/froth on top. The froth will automatically rise to the top, but if aesthetics are important then prevent the foam from exiting the frothing pitcher with a spoon until the milk has been poured, then simply pour the foam on top. Garnish as you like, sit back and enjoy. Cappuccinos are very easy to make and especially newbie friendly! ​Transfer to your mug and prepare to bedazzle your taste buds! ​Sit back and enjoy the most delightful cup of tea of your life! As a budding home-brew barista, it’s important that you also learn how to froth milk without a frother. This skill is much handier than you might imagine. If you’re on vacation, and separated from your equipment, you can still make a good approximation of your favorite coffee drinks, and if you’re at a friend’s house, you can dazzle them with your barista abilities, even if they don’t have any equipment to work with! All you need is a jar with a lid and a microwave oven. Just put your milk (in whatever quantity you need for the drink you’re making) into the jar, seal it with the lid and shake vigorously for 30-60 seconds, until it becomes frothy. Remove the lid and pop it in the microwave for 30-60 seconds (exact time will depend on the microwave). The froth rises to the top. Block the froth with a spoon as you pour the milk into your coffee, then pour the froth out on top last. Voila! Homemade froth, no fancy equipment needed! The best part is that this trick works with any kind of milk, including 2%, soy, almond, and the like. Granted, it’s not quite the same quality you get with professional equipment, but it’s a brilliant trick that can produce surprisingly good results. Note that you may have to experiment a bit to get the consistency right, depending on the type of milk you’re working with, because each one will be a bit different. You’ll save yourself a lot of grief, time and effort if you adopt a “clean up as you go” strategy​ with your equipment, and that’s especially true of your milk frother. If you let the milk sit and dry before cleaning, you’ll simply have to work harder to clean the unit, and why make extra work for yourself. The first step in cleaning is to dismantle the machine so you can get to every nook and cranny, then submerge in warm soapy water and gently wash, rinse and dry, allowing the components to air dry before reassembly. If you’re using an electric frother, then obviously, the components attached to the power cord should never be submerged in water, but the detachable bits can be. These should be cleaned the same way as you clean manual frothers, while the non-submersible components wiped down gently and thoroughly with a warm, damp cloth. If you didn’t get to your equipment right away, and the milk has dried, you’ll need to let it soak for at least an hour before wiping the film away, and even then, some additional scrubbing may be required to remove it all. 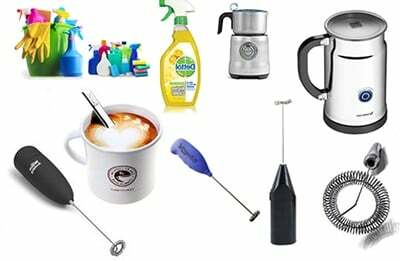 Under no circumstances should scouring pads or abrasive cleaners be used on manual or electric milk frothers. Not only will these scratch your equipment, destroying their beauty, they could also shorten their useful life. If you’re using a frothing wand, the first step in cleaning it is to purge it again after use. At this point, most people just wipe off the exterior and call it done. That can work in the short run, but unless you also clean the interior of the tube, you’re eventually going to have a blockage which will hinder the wand’s performance. The best (and quickest) way to ensure that never happens to you is to purge the steam wand, close the valve, then submerge it into a cup of cold water. You should hear a suction sound as water is drawn up into the wand, then purge it again. The jet of water and steam will push out anything in the tube, and it’ll be ready for your next use. Steaming and frothing milk are (slightly) different processes. Some specialty drinks use steamed milk, while others call for froth. As you now know, if you’re making a drink that calls for froth, you can use warmed (steamed) milk, and in this regard, steaming can be seen as a preparatory step for frothing. You can buy a little electric device that serves as a dedicated steamer, and if you do, there’s really nothing special about using it. It’s programmed to help ensure the temperature of the milk doesn’t get so high that it boils, and gently warms the milk till it hits the “sweet spot,” temperature wise, which is between 150 and 155 degrees Fahrenheit. While a machine like this isn’t necessary, strictly speaking, if you have the spare counter space for it, it’s something you may want to consider, as it’ll help you ensure the proper temperature without having to spot check the milk with an espresso thermometer. And there you have it! Milk and coffee go together even better than chocolate and peanut butter. They’re just two great flavors that taste great together. As you can see, milk not only plays a pivotal role in the creation of a number of specialty coffee creations, but there’s also a lot more to it than first meets the eye. Not only are there several different technologies and techniques you can use to create the desired foam, but getting it right is one part art, and one part science. It’s a skill that’s easy to learn, but it will take time, patience, and experience to master. If you’re a coffee aficionado though, it’s well worth taking that time! Before you know it, you’ll be whipping out masterfully crafted specialty drinks to the delight of your friends and family. Here’s to your success – drink up!